Lavender & Spearmint Essential Oils have been combined with Natural minerals to create a soothing and replenishing foot treatment. 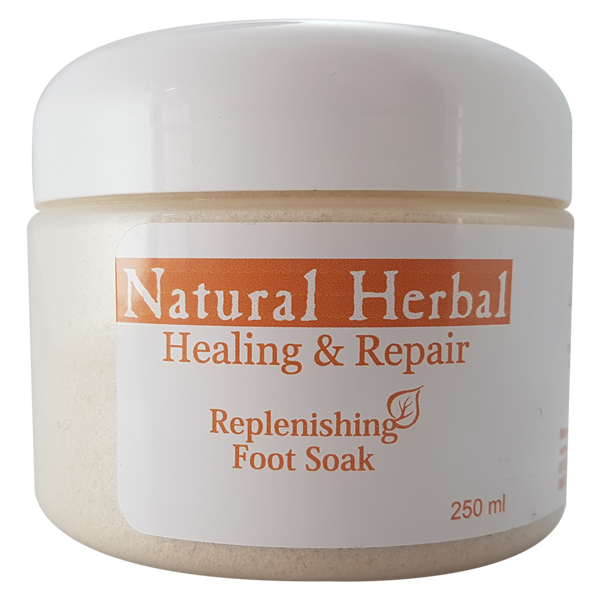 Healing & Repair Range Replenishing Foot Soak contains Spearmint essential oils to soothe the muscles in the feet creating a relaxing and reviving treatment. Spearmint also stimulates blood circulation thereby improving the health of skin cells. Lavender Essential oil has been included for its relaxing and antiseptic properties, thereby contributing to the relaxation and stimulus of the feet and foot muscles. The combination of the 2 oils also reduces swelling of the feet. Dissolve into a basin of lukewarm water and rest the feet in the water for 15 minutes. Soothes and relaxes tired and aching feet.